We serve a free lunch to any and all every Friday from 12 noon thru 1:30 p.m. at Paradise Lutheran Church. Whether you’re looking for a nourishing hot meal, or just don’t want to eat alone, diners come from all over Paradise and Magalia to enjoy delicious soups, great sandwiches, specialty dishes, and yummy desserts. 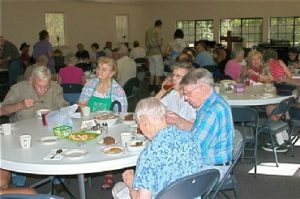 Begun in 2001, this free lunch idea has expanded to several other venues in the community who offer similar meals on the other days of the week. Click here for the schedule of free lunches in Paradise. Lunches are prepared in our modern commercial kitchen and served in our spacious hall by dedicated volunteers from our congregation and others from the broader community. Every Friday volunteers are needed to help prepare, serve, or clean up. 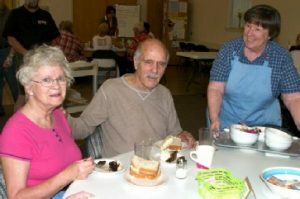 And, while meals are free, donations (including donations of food) are always needed and most welcome. Join us for a great lunch with friends, and meet new friends in the process. All are Welcome!